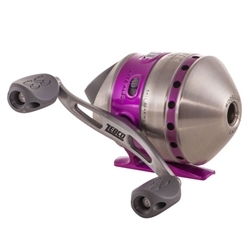 Introducing the world's most popular fishing reel with a Ladies Twist! This Zebco Ladies 33 not only has the statistics of the classic 33, it is now pleasing to the Ladies! It incorporates customized Ladies graphics as well as a striking Pink band all around the reel. This reel not only has the looks but the back bone to back it up such as all-metal gears, auto bait alert system,and a stainless steel cover. This Medium-Light Spincast reel comes pre-spooled with 10lb Cajun monofilament and can be changed for a right or left hand retrieve to meet all lady anglers needs!